There are many ways to play the B chord on guitar. Below are 5 of those ways. Learning how to play the same chord in different ways and around different parts of the fretboard is a great way to add to your repertoire and can really help you to change the flavor of a song, help to add some uniqueness when writing songs and gives you some options when improvising. To clarify: When I say “B”, I mean B major. Most people don’t typically play an open B. 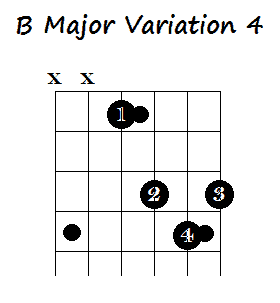 B is usually played as a barre chord (see variation 3 below) as the go-to for most people. But you can play B in the open position without using a barre chord. This first variation of the open B chord isn’t really an open chord – but it’s close to that open position on the fretboard. Only the D, G, B and High E strings are strummed when strumming this chord. I like to bring my thumb over the top of the neck to mute the Low E and A strings so that I don’t accidentally play them – and so that I don’t have to think as hard about my strumming hand. Another variation you can use in the first position is a little bit more difficult to play – but it has a different flavor and makes use of the open B string. There are a couple of variations within this variation. Here you don’t strum the Low E string and you need to either mute the G string (either with your pinky or by flattening out your index finger) or place your pinky finger in the 4th fret of the G string (quite a stretch!). This chord is best used for finger-picking and not strumming, in my opinon, because even muting that G string can still bring in that discordant character – so, unless that discordance is what you’re after, it doesn’t necessarily sound good strumming. The other way you could play this to give it yet another flavor, is to give it an F# bass. Here you would strum all of the strings but you’ll need to flatten out your index finger a little to mute that G string. The Barre B chord is the most played of the B chords and can be played in two main positions. The “A string Barre B” is played by barring the 2nd fret and creating the open A shape in the 4th fret. All the strings except for the Low E are strummed when strumming this chord. How you create the A shape is up to you. Personally, I find more difficult to put all 3 of my fingers into the 4th fret so I make that A shape by barring the D, G, & B strings in the 4th fret with my 3rd finger (ring finger). The “E string Barre B” is played by barring the 7th fret with your index finger and making an open E shape in the 8th and 9th frets. This chord adds an extra B into the chord (6th fret high E string) that’s an octave higher than the highest B in the “A string Barre B”. So whilst people often consider these two barre chords exactly the same, there is a slight difference and a subtly different flavor. 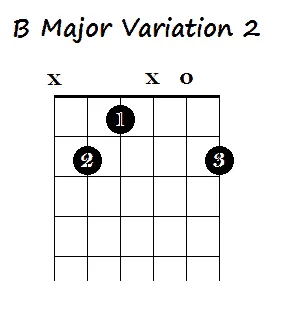 This variation gives a B chord option that is higher up the fretboard. It has a significantly different flavor to the Barre chords we just learned. This chord almost has a ukulele feel to it (IMO). Don’t strum the Low E and A strings when you are strumming this. You can also bring in a F# bass by barring the A and D strings with your 1st finger. I find that this (and without the F# bass) sounds best when fingerpicking or flat-picking but you can strum it too. Now a nice easy one to finish. Strum only the D, G, B and high e strings. This is the same shape as is used for an open F chord. The other way you can play it is by barring the B and low e strings with your 1st finger and using your 2nd and 3rd fingers for the other 2 notes. This frees up your pinky to do other things. Another variation is to barre the B and high e strings with your 1st finger and use your 2nd finger in the 8th fret on the G string, your 3rd finger in the 9th fret A string and your 4th finger in the 9th fret on the D string. This gives you a B with an F# bass. 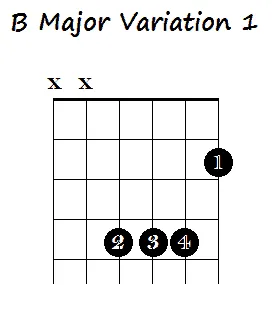 I hope this post has given you some new options for playing the B major chord. Are there any other ways that you like to play the B chord? Feel free to leave a comment below. I would experiment with the different variations and see what feels best for you. The go to for most is playing this as a barre chord, but if you aren’t comfortable playing bar chords then maybe something like Variation 5 would be more comfortable. 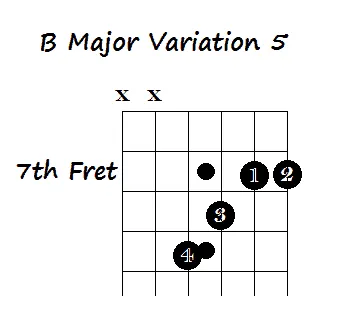 It does mean you’re getting quite far away from the first fret which is where you might be playing most of your other chords – in which case it’s probably not ideal. Maybe you would find variation 2 easier – and it’s closer to other open chords, if that’s what you’re using for your other chords.